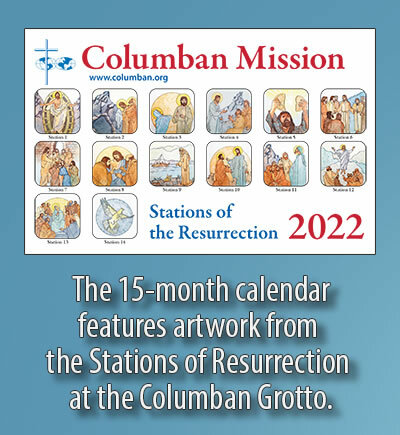 The 2019 Columban Mission Calendar celebrates the work of the Missionary Society of St. Columban. Founded in 1918, Columban priests and lay ministers work in 17 countries helping the poor and marginalized people of the world. The photos throughout the calendar highlight the work made possible by you and others like you. With generous prayerful and financial support, Columban missionaries share the light of Christ around the world, bringing abundant blessings to those most in need. As missionaries, we go where we are not wanted but are needed and leave when we are wanted but not needed. Rarely do we see the fruit of the labors which are undertaken during our time on mission. However, as the pages of this calendar illustrate, the seeds of faith sown by the Columban missionaries who came before us took root and flourished! As a faithful Columban benefactor, we have you to thank for making this holy work of building God’s kingdom here on earth possible. Thank you for your continued generous support. We hope that as you use this calendar throughout the year, you remember how much we value your partnership with us and how much good we are doing in the world together. We remember you in our Masses and daily prayers in gratitude for all you do to spread the Light of the World.